Miral is a film directed by Julian Schnabel and his followup to the widely acclaimed and Academy Award nominated The Diving Bell and the Butterfly. 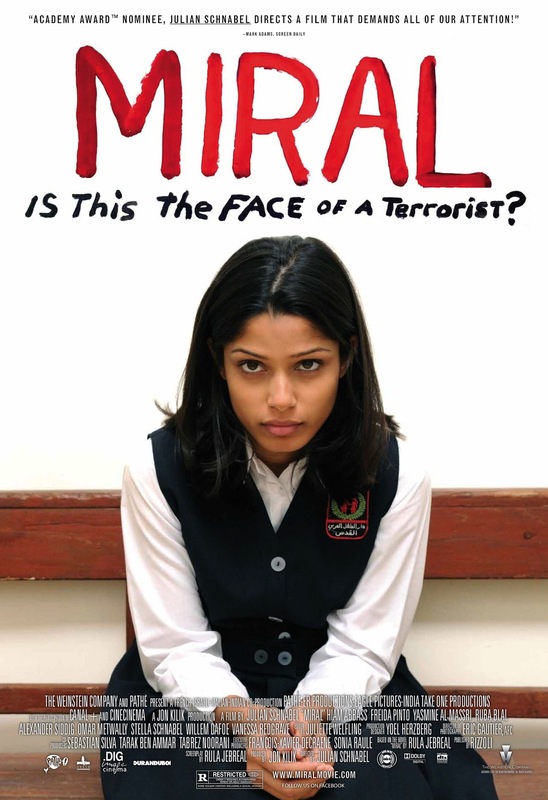 Based on an autobiographical novel by Rula Jebreal, the story centers on Miral (played by Indian actress Frieda Pinto of Slumdog Millionaire fame), a young Palestinian girl growing up in Jerusalem amidst the Israeli/Palestine war who finds herself drawn into the conflict. It is a fascinating emotional and political story, but in the hands of Schnabel results in a film full of misguided stylistic choices and undeveloped plots. The cinematography is handled well by Eric Gautier, but the overly artistic lens filtered sequences, rapid cut editing, and dizzying hand held camera twirls appear more as a distraction than as a dramatic aid. Also the soundtrack featuring Laurie Anderson, Ennio Morricone, A.R. Rahman, and Tom Waits is just a bit too cool for the serious subject on screen. The acting is very good, especially Hiam Abbass as a wealthy Christian woman who runs a school and orphanage; and the very photogenic, though maybe too much so for this type of film, Freida Pinto is nonetheless convincing in the title role. However the narrative jumps around and neither character is given a chance to fully develop. Veteran actors Willem Dafoe and Vannessa Redgrave also have brief cameo appearances early on. At least the film avoids political heavy-handedness, remains mostly neutral, and ends with a glimmer of hope for peace. I love Tom Waits, but I didn't feel the song's placement really fit here. Looks like an inspiring film, I'm liking how they used a Tom Waits song near the end! Shame it wasn't executed as well as it could. Avoiding political heavyhandedness is really tough for a subject like this. That girl is going to be a big big star. No its not really bad, it has a very fascinating story, its just overshadowed by some bad directing. Yeah after his last picture, I was expecting another equally depressing film. This was a bit of a nice surprise. It is a shame, it really could have been a masterpiece, there were some fine performances here.